This position statement has been developed to reflect the guidelines as set out by the National Health and Medical Research Council, Ethical Guidelines on the use of assisted reproductive technology in clinical practice and research (2017) (“NHMRC Ethical Guidelines”) and Fertility Solutions clinic policy. 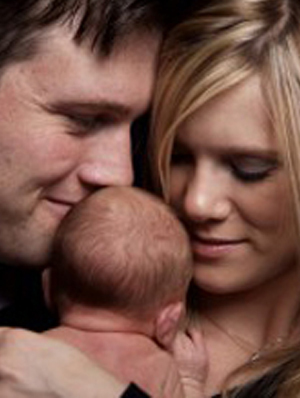 Gamete refers to sperm and eggs whilst an embryo refers to an egg that has been successfully fertilized by a sperm. It is a patients’ responsibility to inform Fertility Solutions of any changes to their contact details and that they respond promptly to the clinic notification in the event that they wish to use or donate any unused embryos. When a patient decides to dispose or use their gametes/embryos all outstanding accounts must be first settled. From time to time teenagers and young adults are required to store gametes due to medical reasons that may affect their ongoing fertility i.e. cancer treatment. These circumstances are extenuating and the maximum storage time of 15 years may not apply. These situations will be dealt with upon an individual basis by written application of the patient to the clinic Quality Management Committee. Separate to the ethical issues expressed above, bodies offering assisted reproductive procedures in Australia must be accredited by the Fertility Society of Australia, which requires compliance with the NHMRC Ethical Guidelines as part of their accreditation process. Fertility Solutions complies with the NHMRC Ethical Guidelines. The NHMRC Ethical Guidelines deal with the issue of gamete and embryo storage and disposal. 7.2.1 Clinics should have policies that guide the clinical determination for continued storage of gametes and embryos. As such Fertility Solutions has adopted the following policy that supersedes the policy relating to the National Health and Medical Research Council, Ethical Guidelines on the use of assisted reproductive technology in clinical practice and research (2007) (“NHMRC Ethical Guidelines”). It is Fertility Solutions policy to provide gamete/embryo storage for 10 years with the option to renew consent for a further 5 years equating to a maximum of 15 years storage. To prevent gametes/embryos from being held in storage after contact is lost with the 3 It is often exceedingly difficult to locate most of the individuals concerned and obtain up to date instructions about what to do with their gametes/embryos. In the case of the initial 10-year period, a further 5 years of storage can be requested in writing to the clinic manager. Patients may consent for the gametes/embryos being donated for the use of infertility treatment of others. This can only occur if the embryos have not been created using donor sperm or eggs. Consent for all the remaining gametes/embryos to be donated for the use of infertility treatment of others. This can only occur if the embryos have not been created using donor sperm or eggs. 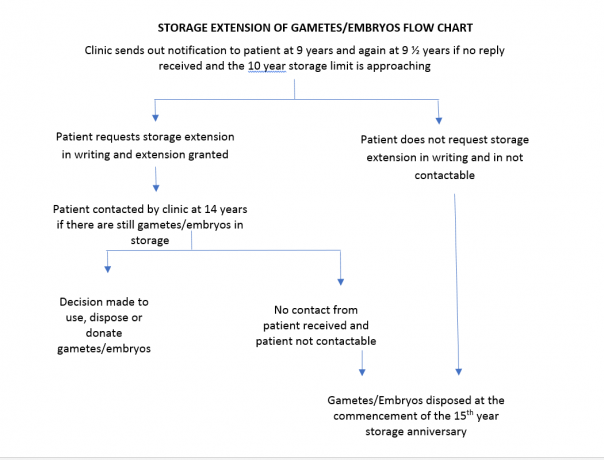 Nine (9) years after the gametes/embryos are cryopreserved (this includes gametes that are imported to Fertility Solutions from another clinic and reach the age of 9 years since created), Fertility Solutions will write to the patient(s) via post (unless requested otherwise) and remind them that there are still gametes/embryos in storage, advising them of their options and asking them to take action in accordance with the option chosen. If a written response is not received within 6 months a reminder letter will be sent via post. If advice has not been received in writing regarding a choice on or before the 15th anniversary of the storage of the gametes/embryos, the clinic will arrange for the disposal of the gametes/embryos by respectfully allowing them to succumb. Please note any outstanding accounts will still be applicable after disposal occurs. If Fertility Solutions Staff cannot contact the patient, their account will be sent to the debt collection agency to purse. Patients will be liable for the debt collection fee. 1 Reproductive Technology Council ofWestern Australia, Policyon Embryos Storage and Applications to Extend Storage Beyond TenYears, Reproductive Technology Council, February 2010, 3. 2 Notebook/Talk of the Streets, London: Embryo Ethics, TIME INT’L, August 5, 1996, at 6.